You have to be of a certain age to remember when Tottenham had a season to match the one that ended yesterday. That Magnificent Seven performance was hell for Hull but heavenly for we success-starved Lilywhites. I am under increasing pressure from the younger generation to declare this inspired Spurs side the best Tottenham team of my life time. The highest League position since back in 1963 certainly gives them ammunition for their argument. But � sorry � I must keep faith with my old heroes, and I repeat they cannot be held up as superior to Arthur Rowe�s Push and Run champions and Bill Nicholson�s dynamic Double team. Better to watch? You obviously never saw Sonny Walters and Les Medley hurtling down the touchline and having their crosses smashed into the net by Len Duquemin and Les Bennett. More potent in front of goal? The Double team, with beefy Bobby Smith and the gliding Les Allen leading the way, scored the little matter of 115 League goals in 1960-61. Goal gourmet Greavsie arrived the following season. Cheered on by noisier fans? I often couldn�t hear myself think in the White Hart Lane press box as I shouted my match reports down the telephone on the glory-glory European nights in the 1960s that always drew 60,000+ crowds. The only way the current side can be considered equal to the Ronnie Burgess/Danny Blanchflower motivated teams is to win silverware, and that is surely around the corner IF Mauricio Pochettino can keep this hugely talented squad of players together. My advice is that we should wear blindfolds and earplugs during the next few months, when transfer gossip is going to hit the Richter Scale. And it can only be gossip unless you have the ear of Joe Lewis in the Bahamas, Daniel Levy in his ivory tower, Mauricio in his hideaway or any of their closest associates. It is easier to get secrets out of the White House than transfer news from the inner sanctum of Tottenham. The stories you read in the newspapers and on line are fanned by agents looking for their percentages, but it is tittle-tattle and never from the mouths of the few people who know the facts. Instantly, I thought it was about clubs fighting to prise Our No 10 Harry Kane from Tottenham. Of course, it was May versus Corbyn � and they would not be worth a penny in the transfer market. They�d find football far too taxing. Imagine how many goals �three season wonder� Harry would have scored had he not missed a quarter of the games through injury! Our webmaster Paul Smith captures his latest barnstorming performance HERE, featuring Harry�s second hat-trick in four days. It is Greaves-like in consistency and class. I never dreamt I would write a sentence like that as I gallop into my autumn years. I always thought that Jimmy was the sort of goal machine that came along only once in a life time. 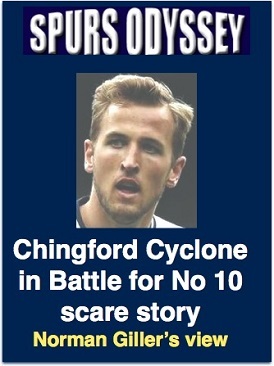 Now we have the Chingford Cyclone banging in goals with Greavsie frequency. Harry knows his Tottenham history and will be proud to be mentioned in the same breath as the one and only Greavsie. They were born in areas just 20 minutes apart, which is how long it takes to drive from Chingford round the North Circular to Jimmy�s birthplace at East Ham. I Tweeted Harry (@HKane) and congratulated him on retaining the Golden Boot and added that he should keep his feet on the ground, except when heading the ball. The sudden fame is not going to his head, and this old git considers him a wonderful advertisement for his often-maligned generation. My sympathy yesterday was with the formidable Frenchman Hugo Lloris, who would have got a share of the Golden Glove but for that scrappy Hull goal. Just imagine, Harry with the Golden Boot and Hugo with the Golden Glove, perfection at both ends of the pitch. Friends, we are in at the start of a golden era. Enjoy! This is Edward Benson, the New York based lawyer who is the new Spurs Odyssey Quiz League king. He is pictured against the iconic Manhattan backdrop, holding the coveted framed certificate announcing him as 2016-17 champion. Raised in Southgate, Edward had to show courtroom powers of discipline and dedication on his journey as a Tottenham aficionado. His late Dad was a proud Gooner, and Edward now preaches the gospel of Spurs in the States, where he is a respected attorney of law. So far he has resisted wearing the Spurs cap when addressing the judge. He will be bidding to become the first champion to retain the title when we kick off a fourth Spurs Odyssey Quiz League in August. Previous champions David Guthrie and Glen Scarcliffe, another legal eagle, are already in training to try to regain the crown. Meantime, I will set a weekly Tottenham teaser, just for fun and to keep you thinking about the club�s great history. The answer was Jonathan Woodgate, who headed the extra-time winner in the 2008 League Cup final against Chelsea. I managed to confuse the early readers of my blog by calling it the Uefa Cup. Senior moment, sorry. First name drawn from those who picked up on my mistake was Cyril Wright, a Spurs fan for 30 years who lives off Seven Sisters Road right in the heart of Tottenham territory. I will send Cyril a screen version of my Spurs �67 book (you might consider buying a signed copy from me at http://www.normangillerbooks.com � all profits to the Tottenham Tribute Trust to help our old heroes. This week�s teaser: Who made the final pass from which Ricky Villa set off on his dribbling run to score the �Wembley goal of the century� in the 1981 FA Cup final replay against Manchester City? Email your answer please to SOQLTeaser2@normangillerbooks.com. Closing date: midnight this Friday. I will send a screen version of one of my Tottenham-themed books to the first name drawn from the correct answers.